Mulligan Music Ltd. is pleased to announce the release of an album by Barry Moore entitled Treaty Stone. Barry Moore (born in Newbridge, Co. Kildare in 1955) has built up a reputation as a singer/songwriter/guitarist playing the various folk clubs over the last two years. More recently he has toured England and last year toured Germany as member of Inchiquin, an excellent traditional group from Clare. Barry's music is contemporary and for the most part self-penned. 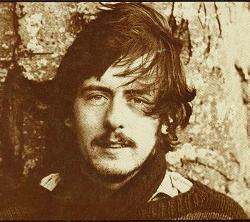 One of his first songs Wave Up To The Shore was recorded by Christy Moore (Barry's brother) in 1976. With the exception of two songs, all the material on this, his first solo album, is self-penned. Many of Barry's songs, though contemporary, display a deep love, understanding and feeling for traditional singing and songwriting. On this album Barry's rich vocals and superb guitar playing backed by cello, flutes and the slide-guitar of Midnight Well's Gerry O'Beirne. This mixture of string and wind instruments gives the sound a unique quality of gentleness and depth. With the exception of Lonesome Robin, learned from Guy Carawan and written by Bob Coltman, and Black Is The Colour, a traditional song learned from Hamish Imlach, the songs were written by Barry himself. Deep Is The Night, was written in Berlin during the winter of '74 when, as Barry remembers "it was so cold you had to put food into the fridge to thaw it out". Bury My Heart At Wounded Knee, is based on the book of the same title by Dee Brown, which is an Indian history of the American West. As is 'Bury My Heart' mans right to freedom is the theme of It's Not Good Enough. The instrumental Little Martha And Me was inspired by the playing of Duane Allman and Dickey Betts.